A Church School was added in 1905, and material improvements were made to the chancel and the church. On September 15, 1907, it was voted to organize St. John's Church under the jurisdiction of the Archdeaconry of Lowell. By-laws were adopted and a vestry elected. From 1918-1922 monies were raised and the parish house (now Ashworth Hall) was built. A house at 37 Pleasant Street was purchased and served as a rectory in the 1920's. The rebuilding of the church edifice commenced in March of 1927. Among other changes, a new sanctuary was constructed, the new front facing on Central Street. On November 10, 1927, the Church was re-opened and rededicated. 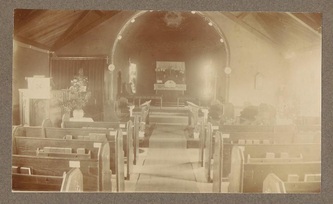 The Chapel of the Ascension (now in the Hurll Room) was consecrated in May, 1941. Local women gathered in the Parish Hall twice weekly to sew for the Red Cross. An active chapter of the British Relief was organized. On July 9, 1944, the church was elevated from the status of a mission to that of a parish, the Service of Institution being performed by Bishop Sherrill. In 1947, “Good News,” a weekly newsletter listing the current activities of the church, was originated. A new circular stained glass window was placed above the altar in memory of former Sunday School Superintendent, James G. Ash, and dedicated on November 21, 1948.